Cons: I have the occasional frustration getting exactly the information I am looking for on reports - this is likley a training issue that could be solved by re-reading the manual. Overall: Using the @Ease database has really improved the capturing of our information through features such as the receipt notes and qualities. I have access to all our Foundation's information at my finger tips that is so much more specific than what appears in deposit books or the memo line of cheques. Our bookkeeping practices are more sound and error-proof now than before. I also make great use of the mail merge features and report printing for presenting to my Board of Directors. Cons: It is sometimes hard to follow the path that tech support offers, I think because it's so intuitive for them. I need to be sure that I am asking questions very clearly and that I am asking them to slow down so I can actually learn from the tech support conversation. Overall: I've worked with a big database that everyone has heard of and can say that @ease is capable of everything that I ever used that big one for - and at a fraction of the price. Donors, memberships, volunteers - You couldn't ask for more responsive customer service. The tutorials are well worth the time. Recommendations to other buyers: I have struggled to keep skills sharp with this program after a couple of leaves from work and with everything else I have to do so I know I'm not using it to its full advantage. Pros: it has a lot of information at hand. Once you know how to use it, it is very useful. The reports are very helpful. The support is GREAT! Cons: would like to be able to access more data/information from the reports - it would be nice to be able to drill down in some of them (similar to simply accounting). It takes awhile to understand and use. Thank you for your review. Learning how software of any kind works does take time. I have lots of experience in this area having had to learn numerous languages and applications. Regarding the drill down, unfortunately our reports are just that print ready, so different applications do work differently. There are several ways to examine those who have donated to a campaign or to review a donor's gifts. Give us some feedback and we may be able to add a new report with more of the information you are looking for. @Ease has been able to deliver a multitude of vital services to help us utilize donor management. Comments: Pros: We are able to easily capture and track: donor info, donation summaries, and donor trends to help us achieve our fundraising goals. We are able to pull and analyze practically any report that we desire, which is helpful with forecasting campaigns and evaluating our successes. It is also a great tool for scheduling grants, proposals, and Impact Reports, which is important with fundraising and donor stewardship. Cons: The updates to the software can be complicating and confusing, especially if you have @Ease on a multitude of computers. It can be highly open to human error with data entry, which means you need to remain at a high level of focus when entering donation information. There are times that you need multiple windows open when performing a task, however, you need to close windows that have vital information in order to open up another window that has other vital info that you need, resulting in having to write down information on paper or trying to remember key information. Trained people are the ones needed for accurate data entry. Unfortunately, the only one responsible for the data entered is the person at the keyboard. We strongly recommend training because guess work can be dangerous. Optionally we have added features to help with entry as in the case of bulk hours for volunteer work, where an entry person was unaware that New was required between entries otherwise the activity was viewed as an update. New prompts were added to help the data entry people identify what state they were in ... New or Update. Regarding windows, the profile windows that reside behind the master table windows do need to be closed before toggling between windows. The Donor Profile Report can be very useful when multiple fields are needed. 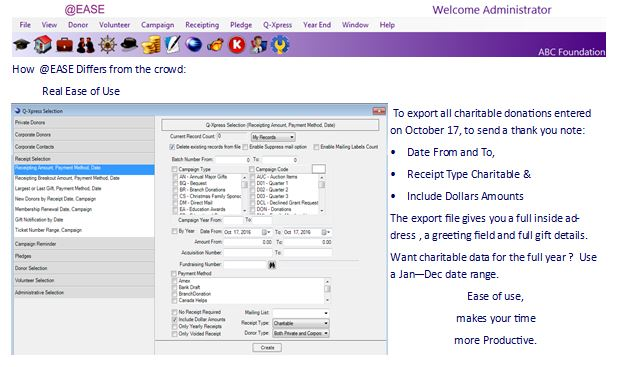 Pros: @Ease is a very comprehensive software for charities, covering almost every eventuality from type of data that needs to captured, to reporting and data extraction. Cons: E-receipts are tricky when errors need to be corrected. Overall: The longer I use @Ease, the more I like it - I'll need to run a new kind of report and find the parameters there already. The basic data entry is very easy to do and the accounting data is easy to set up - the System Maintenance options are sensible and easy to set up. Pros: I value the excellent customer service ... always a quick response to any questions or concerns I have. I also enjoy being able to email receipts vs printing & mailing - it saves time and money. 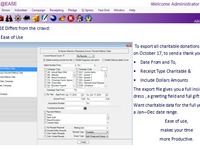 We primarily use EASE for receipting and contacting donors, there is much more that an organization could access. Cons: The software is great ... some of the reporting can be a bit confusing until you get the hang of it but it's often due to a lack of knowledge & experience on my part. Overall: Time is always an issue for any organization especially if you have a smaller number of staff taking care of multiple tasks. I find the EASE program easy to learn and the emailing of receipts efficient & time saving. Our rep is wonderful - always responding quickly with solutions to questions that can be unique to our charity. Pros: This software is very user friendly. Pledge management, Import, Q express & Reports features are excellent. Great support & training from support team. Cons: Raise Funds with Ease & Donate Now can be improved. Overall: I have been using this software since 2005. When doing mass mail outs Q Express works well with mail merge. 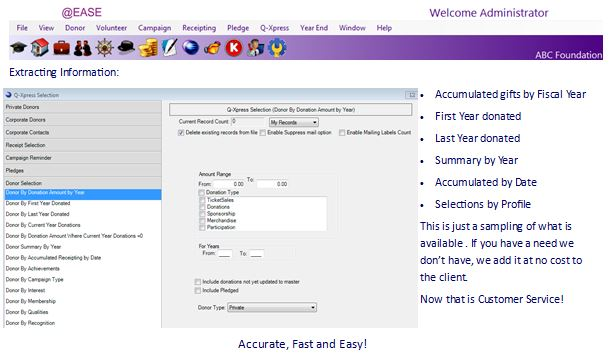 Easy to get new donors into the system with Import utility. Customer support is always there to help us. Working with @Ease is a breeze! Overall: Sharron and the crew at Batsch Group are on top of the fundraising world. Always just a phonecall or email away with guidance or advice, with a variety of tutorials and webinars for every situation. I highly recommend @Ease for all of your fundraising needs. @EASE is windows based. I think they may have meant Cloud based. We do have a Cloud option using the MS AZURE cloud. Unfortunately, many hospital foundations cannot go cloud based in Canada due to privacy rules. Pros: It is detailed. There are lots of options for reporting. Overall: We manage a donor and member database of just over 2000 and growing. Sharron Batsch and the @ease software enables us do do just that. 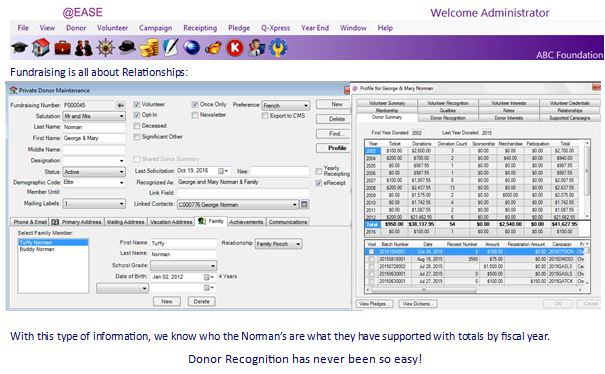 Manage, organize & take control of tracking, receipting, and most importantly acknowledgement of our donors & members. The database is shared among Administration and Professional Development. We have received excellent training from Sharron and absolutlely the very best support. Pros: The features I want are easy to use and it does not require being a computer programmer to create reports etc. Cons: I haven't discovered any real cons. The only advice I have is to use it often so your learning keeps on developing. Like anything... if you don't use it, you will lose it. Overall: As an Executive Director of a small foundation, I know it is important for me to have access to information as I need it. @Ease has been a great software to use that has been very friendly for someone like me who is not afraid to get their hands in! Recommendations to other buyers: Experiment with the reports. There are lots of ways to analyze your data. Easy peasy donor management software! 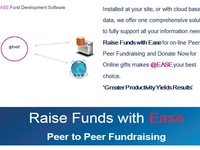 Pros: What I liked most about @ease that I could quickly learn how to use this software in no time because of its easy and quick functionality of capturing donors/donations and tracking them. Cons: So far I like this software very much and have no comments on cons. Pros: It is straightforward, easy to learn, amazing support, reasonable price, costs are not dependent on fluctuations of the Canadian dollar. Overall: Everything is in one place. I can run amazing reports. It far out performs DonorPerfect or Raisers Edge and it is Canadian. Really appreciate how accessible Sharron is to her clients! Overall: @ Ease is the only fundraising tool I am familiar with. I find it very easy to use and maintain and like the reports I can generate from it. I really appreciate how available Sharron is when it comes to needing any type of help or information. I enjoy the tutorials and classes that are provided. @Ease makes my job easy! Pros: The ease of pulling reports that are needed. Overall: I have been using @ease for 8 years. Sharron and her team offer excellent support! 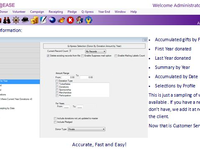 @Ease is user friendly and I am able to provide reports, mail lists, etc in minutes. Pros: Good reliable software, takes care of all of our needs. Overall: Always great support from Sharron and team whenever needed. Just a phone call away. Easy fundraising database to work with. Great program for generating reports especially when working with auditors and year end. Pros: Straightforward. Simple to get amazing reports. Easy to train new users. Customer support is exceptional. Cons: Can't think of anything. If I had a complaint it would be with non-profits opting for US software not Canadian. Overall: All my development information is consolidated in one spot. No more using Access, Excel or QuickBooks to record information. All available at the click of a button! Pros: Very easy to use and exceptional support. Cons: I actually can't think of anything that I don't like about the software. Overall: Creating reports for finances and CRA. Tracking our donations and campaigns..
Pros: What I like the most about the software is that it is easy to use and provides you with all of the options that you would ever be looking for when running reports of looking up specific information. Cons: There is nothing I could state at this time about what I like the least about this software. Overall: @EASE has made tracking specific groups very easy. It has also given us a easy and well informed list of all of our contacts, contributions, and helped immensely with charitable receipting and with our fundraising project. Overall: Using @Ease is very easy and quick. Not at all cumbersome like some databases. The Q-Xpress feature makes pulling information quick and easy. Comments: My experience with @Ease is been excellent. Pleasant to talk to the customer service and the tech support. I have all good praises with @ease people and the software. Overall: Like many a fundraiser, when I was hired I got very little orientation/training. I saw the tutorials etc but had little time to go through them and less time to attend training in Edmonton. There were some internal IT issues as well, so ease of use score is certainly partly on our side to blame. The phone support I receive is outstanding and provided very quickly so that's the best part of my user experience. Recommendations to other buyers: I'm learning! Thank you for your review. Sorry you gave us such a low ease of use score, where in most cases @EASE receives 4 of 5 out of 5. Training is important when managing such an important asset. Thank you for your comments on our service. We love our work and the ability we have to help our clients. Hopefully your management will provide you with time and funds to attend some courses. We offer on-line one-on-one training as an option to travel. Chat soon? @ease has been valuable mostly in tracking our donations and contacts. 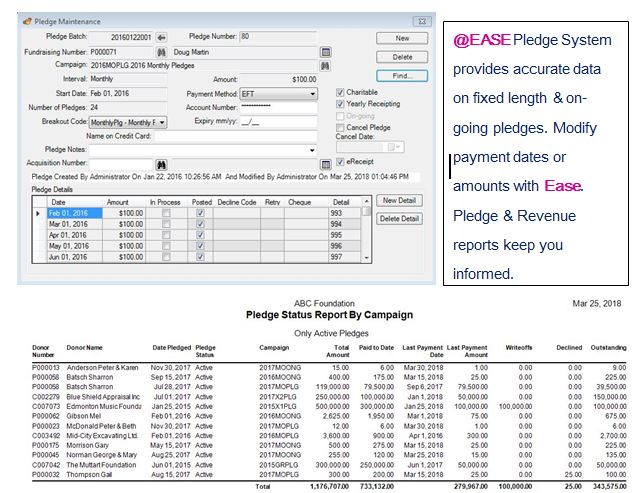 Comments: @ease has been effective for tracking all donations for our agency and providing reports on donors, contacts and information for our board. It takes time to use and learn but if offers so much more than what we utilize. The purpose of purchasing @ease was that our agency could "grow" into using more features and have it as an agency used database for tracking all external contacts, especially for succession planning. We are planning to used the DONATE feature and incorporating it in to our special events. When there is something that we need to get from the software and it does not provide it, there is the opportunity to have that feature added for all users purpose. Being on it and using it is the key to success for any user and they must be trained to have the knowledge and expertise for consistent data input. Pros: It is the backup for everything we do; fund development, events, volunteers, etc. Cons: If I've made a mistake and have already printed the receipt it is difficult to fix the error. Overall: Even though I still struggle on occasion I don't know what I'd do without the support contract. We have been with @Ease for over 7 years and its truly a program worth learning. I'm sure if we used it to full capacity the benefits would be even greater! Recommendations to other buyers: Study, practise, study, practise! Easy to learn and user friendly. Comments: Processing donations and printing receipts are fast and easy. Can track proposals and correspondences relating to a donor, volunteers etc. Generating various reports is simple. Import utility is the best. Bringing in new data and updating existing data is very simple with this. Excellent support from Sharron and her staff. Easy to do updates & upgrades. I learnt a lot by just clicking on the tutorials. I always enjoy the training classes done by Sharrron. I have been using this software for 10 years and I never had any complaints. Now we have started using Donate Now and it is working well for us. Comments: the @Ease program is continually being upgraded and new features added to ensure top performance. Customer service has prompt reaction time with on line assistance to solve any problems. Training is important for any organization wanting to use the full range of features @EASE offers. Tutorials are provided through the software well as on-line webinars to support learning. Clients can request special one on one sessions for specific areas. We look forward to continuing to build ease of use and functionality for this charity. Comments: My experience with the software has been fairly minimal at this point. This is a new position for me and I have been using it for about two months. The basic entries are straight forward and make it easy to keep track of donations and donor information. I took a 'new user' course with Sharron and found her to be extremely helpful and informative. The course opened my eyes to the the wide variety of functions and information that can be monitored with the program. I look forward to implementing many of the options that we are not currently using. Comments: Camp Health, Hope & Happiness is a registered charity and we have used @EASE for many years with different staff members easily learning & working in the program over that time. It is user friendly and when utilized to full capacity provides endless possibilities. I have learned basic elements of the program and am currently exploring new and interesting aspects - with much more yet to learn as my responsibilities increase. I absolutely recommend @EASE for all of your fundraising needs - you will not be disappointed. Comments: The @Ease program has been a proven asset to our donor management needs! The program has a plethora of options for data segmenting, data mining, and reporting. If I ever have trouble with the program, or I cannot figure out how to do something, the Batsch Group team is ALWAYS there to help. Sharron Batsch was once in Spain on holidays and was willing to log in with me to fix a big problem we were having. She is dedicated and truly knowledgeable, and wonderful to work with. I HIGHLY recommend @Ease and the Batsch Group team! Overall: We used to use a complicated, archaic database with poor customer service. We dreaded doing data pulls. Not only is @Ease intuitive, the customer service is superb. Comments: I have used @Ease software for the past 10 years. They are a good company to work with and have always helped us out when we've had any questions. They are willing to work with their customers, the end users, to make sure the program is helpful and does what they need it to do. There have specifically designed the program based on how we wanted to use it for our fundraising and this is excellent for our organization. Overall the product is quite good for the small to mid size charitable organizations. Comments: The software is relatively easy to use and navigate. Data entry is straight forward. It provides the essentials that most non profit organizations need. Often non profits will spend huge amounts on competitive fundraising software that is more sophisticated but they don't need it. @Ease provides good value for your total investment. 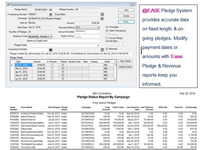 The software could add more standard reports that fundraisers need. Comments: This is a great Canadian product that our smaller hospital foundation purchased aproximately 6 years ago. We have been extremely happy with the ease of its use and the support that the Batsch Group gives is exceptional. I have been to Edmonton for two separate customize training session and with out a word of a doubt that ability for us to better target our donors is amazing. I highly recommend the product and the company. Comments: The Batsch Group is committed to top-quality customer service and provides a fantastic, user-friendly software program for non-profit organizations. @Ease meets the tracking and fundraising needs of non-profit groups. The tutorials on the website, webinars, and in-house courses, as well as the helpful advice/teaching of the friendly, knowledgeable staff keeps you positive and confident that your data is safe and reliable. I took over from someone with only a week to learn it. Comments: The software was easy to follow and I found that doing it for a bit and then taking the training worked very well. The training was good and certainly gave me a better idea of all what the program can do. Customer service is #1 and any and everytime I called I got the answer. Couldn't ask for better. Still in learning phase. We are finding the product very useful. Comments: I have been using the software for approximately 4 months and there is much still to learn. Once a process is learned, the software is very easy to use. The support has been excellent with immediate response to any questions. Currently I do not have any negatives regarding this software. I find this software super easy to use! It makes my job easy! Comments: Our organization does not use @Ease to its full advantage, but what we use it for is very beneficial. I wouldn't even consider switching to another database! The staff at @Ease have always been approachable, friendly and willing to assist whenever we've needed them. We use the software for fundraising and member management. Comments: We use the software for management of almost every activity we engage in for fundraising. Very easy to use, intuitive learning and very economical. Easily the best return on investment. 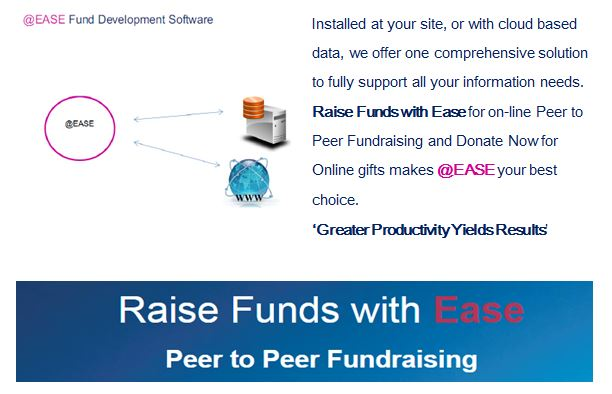 Comments: It's a great fundraising database program and the professional service from the @EASE staff is excellent!!! Sharron goes above and beyond to assist us with any of our needs. Comments: Based on client feedback, @EASE is frequently updated with useful features. It is easy to install and maintain. Sharron is very quick to respond to all support enquiries.